Argyll Mansions is an imposing sandstone Victorian building with a prominent waterfront position. Beautifully presented and spacious, this three bedroom apartment oozes charm and elegance. You will not be disappointed staying in our luxury apartment. It sleeps up to five, so is large enough for a family but is cosy enough for two and is centrally situated on the third floor of the prestigious, Category B listed building. Built between 1905/07, Argyll Mansions has been described as “one of Scotland’s finest tenements” and represents a late work by architect William Leiper, with stunning panoramic views over Oban Bay and the islands beyond of Kerrera, Mull & Lismore. 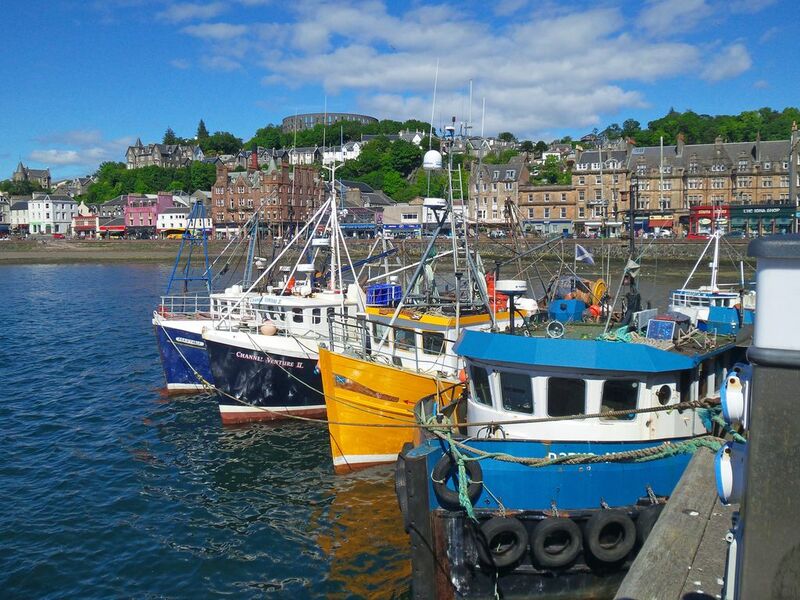 Everything is on your doorstep, from Oban’s many renowned restaurants in the town and surrounding area to its many curio shops and streets to keep you busy and entertained. There is also a two screen cinema and a leisure centre. Or you might enjoy taking a walk down to the beaches at Ganavan, or a short ferry trip to the Island of Kerrera with its very own castle, and in summer a Tearoom! Oban is known as the "Seafood Capital of Scotland" with a fishing boat fleet in the bay, a good range of seafood restaurants and an excellent fish shop, and it is also known as the “Gateway to the Isles” with its busy Calmac ferry terminal for trips to Mull, Colonsay, Mull, Tiree, Lismore and Barra. we purchased the property because we fell in love with it & captures all the very best Oban has to offer from its magical Views to the Islands of Mull, Kerrera & Lismore. It has so much character & history built in 1905 & captures all the very best Oban has to offer from its magical Views to the Islands of Mull, Kerrera & Lismore. to its "Seafood Capitol of Scotland" restaurants all on your doorstep. Great Big flat in Center of Oban. Everything you need that is clean, and a home from Home. Would recommend this property and will always remember the views. The location of Argyll Mansions could not be better; it's right in the centre of Oban, just yards from restaurants, shops, cafes, railway and bus stations, and the ferry terminal. There are lofty views over the busy harbour to Kerrera and, in the distance, Mull. The price to be paid is three flights of stairs to be climbed, so you need to be reasonably fit. The flat is posh Victorian in style, with comfortable modern furniture and a particularly well kitted-out kitchen. Two lightbulbs needed changing during our stay, but this was very quickly attended to by the owner. Car parking is a perennial issue in Oban, but we had no difficulty coping. We had a fabulous long weekend. The apartment was very comfortable and cosy. It was spacious, well equipped and with stunning views across the bay. Just beware for those less mobile there are a lot of stairs to climb, however the apartment and views are worth it. The location is amazing but simple things lacked attention - lightbulb not working in the living room, no tv remote control. Basics like tea, coffee, toiletries not supplied. For the price, these should be basics. Beautiful apartment - awesome location and views. I would highly recommend this to anyone staying in Oban. The location is excellent and views are amazing. The apartment was beautiful and has everything you need. The beds are all very comfortable. There are three flights of stairs to get to the apartment but we were advised of this before booking. We only stayed the one night but would book again if we ever return to Oban. Argyll Mansions was our perfect base to explore the western isles from Oban for a week in May. As well as the fantastic accommodation, we were blessed by 26 degrees sunny weather every day of our week stay. From our first communication with Samantha at West Coast Cottages we were very impressed by the attention to detail of our booking with young twins. The apartment and its rooms felt very homely and comfortable and it is huge, it actually had a regal feel with its high ceilings, period features and huge decorative fireplace. It had every modern amenity including quality TV, DVD player, dishwasher, washing machine and dryer, superfast broadband etc. We highly recommend this quality apartment. Oh and the views over the harbour and islands are spectacular.